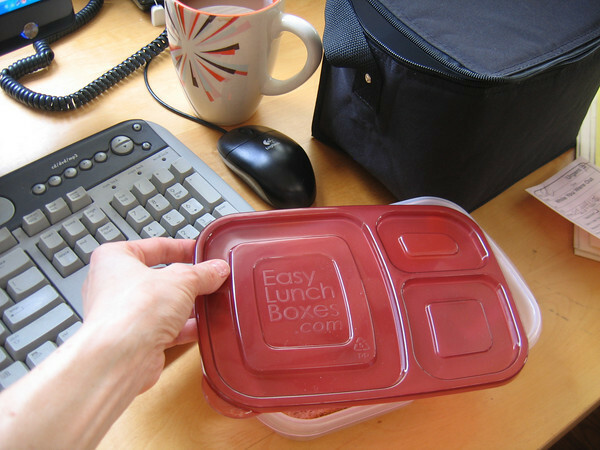 Pack waste free lunch boxes fast with single-lid, 3-compartment, bento-style plastic food containers from EasyLunchBoxes. 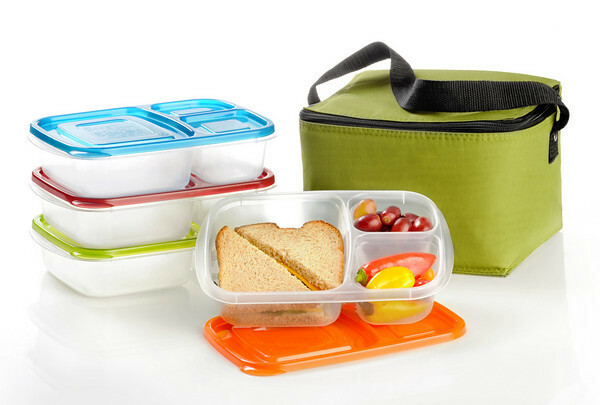 The EasyLunchBox system combines food-safe, BPA-free reusable containers and roomy cooler bags for work or school lunches. This is the best lunchbox system to turn your kids' lunch ideas into school lunches they can’t resist, or to make your own healthy meal ideas a snap to pack for work. It's the green, sack lunch alternative — sized just right for kids and adults. EasyLunchBoxes.com was born out of the creator's response to disturbingly unhealthy school lunch programs. She resolved to send her kids to school with nutritious meals, using little to no wasteful packaging. And though she was very concerned with her family's health and nutrition, as a busy mom, she wanted something fast and easy, yet healthy. So she created EasyLunchBoxes! 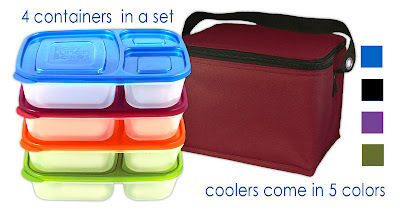 I received the EasyLunchBox system of 4 food storage containers each with a different colored lid along with a black cooler lunch bag. I picked the black bag so it would look sleek since I knew I'd be using this lunch box system for taking lunch to my job. I love that you get four different compartmentalized containers with EasyLunchBoxes so that you can use a new container each day rather than having to wash the same one every night. 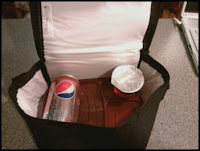 I also like that this eliminates the use of plastic ziploc bags and allows me to pack hard-boiled eggs, sausage, and veggies in one container while still keeping it separated and also keeping the food items protected from getting crushed by pop cans or other drinks you put in your lunch. The lunch bag is very roomy and you can even stack two storage containers in one lunch bag if you take a breakfast and lunch or snacks along with a lunch. I'm happy that the containers are non toxic, food safe, BPA, PVC & phthalate free, plus they are safe for refrigerator, freezer, microwave, and dishwasher. The only thing that I wish was a little more improved on the storage containers is that they are not leakproof. For myself, I don't take anything that needs a leakproof container in my lunch, but it would be nice just to know that the lids would keep in liquids or small pieces of food if needed. All in all, I love how easy and fast it is to pack my lunch with the EasyLunchBox set, plus it saves me money since I don't need to buy ziploc bags or other food storage materials. 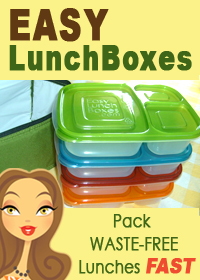 I would definitely recommend EasyLunchBoxes for anyone who packs lunch for their kids or themselves, it is easy, fast, and environmentally-friendly. Win It: Enter here to win an EasyLunchBoxes set! Mandatory Entry: Visit the Easy Lunch Boxes website then come back here and leave a comment on this post telling me something you learned. Contest Details: Giveaway will end on Wednesday, January 19. US and Canadian residents only. Winner will be drawn via random number generator. Winner will be contacted by email and will have 48 hours to reply before a new winner is chosen. Please do not enter if you have won or received free product from EasyLunchBoxes within the past 3 months. I learned that I really want this. The 3 compartments with the lunch box will be really easy to make my own lunches. That way I can put a salad, with cottage cheese and dressing in the different compartments. These will stack easier and I will have less lids to keep track of. I learned that they are very spacious. 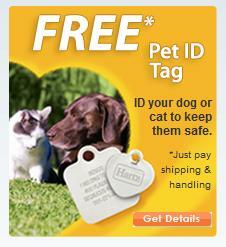 I never thought about all the different ways you could put lunchbag tags on! I love all the different ideas from the photos to the charms. I learned that you can clean odors the lunch bag by putting a piece of bread soaked in distilled vinegar in the bag and then leaving it overnight. I like how they can nest together with storage. I fix my son's lunch every day for school and this is absolutely perfect!...and they come in his favorite color green! I love that their website has pages of lunchbox ideas on what to pack. I need several of these Easy Lunchboxes, I hope I can win one! I follow Easy Lunchboxes on FB. Follow you on Twitter, skipbang. Following Easy Lunchboxes on Twitter. I learned that they are spacious enough for drinks too. I pack my daughter's lunch every day and feel guilty about how many plastic bags we go through. This would definitely fix that problem.